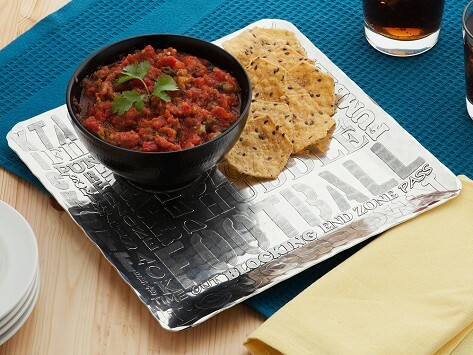 This hand-hammered aluminum chip tray features an engraved array of phrases and terms from your favorite sport (baseball, football, or hockey). With the coordinating stoneware dip bowl, this set is an elegant, lasting way to serve up some game day spirit. Dimensions: Bowl: 2.5" x 5.75" diameter; Plate: 11" x 11"
Weight: Bowl: 1 lb. ; Plate: 0.95 lb.